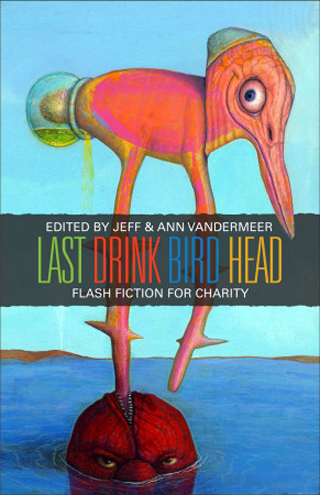 Last Drink Bird Head is edited by Ann and Jeff VanderMeer. All proceeds from the book go to Proliteracy.org. With publishing houses downsizing, bookstores closing, jobs disappearing, and the great Recession Beast stomping down Wall Street, 2009 was one of the publishing industry's harshest years. However, a wise man once wrote that during the worst of times there are also the best of times, and several people stepped up to demonstrate the best in the SF community. During the height of last year's problems, readers came out of the World Wide woodwork to help support their favorite writers and artists, small publishers and arduous editors produced collections solely for charity, and satirical cartoonists championed toy drives for children's hospitals. To honor those generous people, and hopefully to inspire others, the articles department is making January charity month, where our editors will profile and highlight a few (among the many) of last year's magnanimous efforts. There's always the challenge of figuring out how a particular project fits into your overall plans, and how to approach it. In this case, with a prompt that was similar to a surrealist writing game—writers just got "Last Drink Bird Head. Who or what is it? 500 words" and a deadline for guidelines—and something relatively whimsical and quirky, it seemed a good fit for charity, and for an indie press. It turned out great—it's a beautiful book. When he [Jeff] asked me what kind of charity would be a good one for this project, we started coming up with a list of criteria: first, it must be international, as many of our contributors were from all over the globe; second, no religious or political affiliations, as we wanted all contributors and customers to feel good about the project; and third, we wanted something that addressed the issue of reading and literature. After much research I asked my good friend Carol Chenoweth (who is a librarian) and she suggested ProLiteracy.org. They do World-wide reach and yet function at a grassroots level. In addition to fundraising for ProLiteracy.org, the book is also a vehicle for promoting service within the SF community with the Last Drink Bird Head Awards. The inaugural awards were presented last October during the book's release party at World Fantasy. 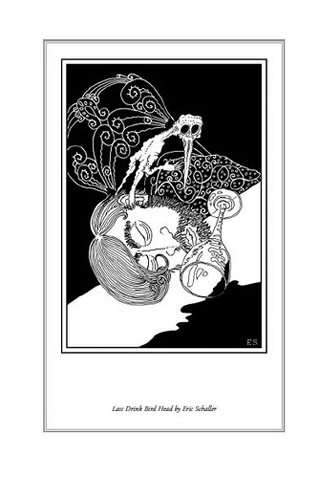 Illustrator Eric Schaller was one of the many who donated work to the Last Drink Bird Head cause. Some of the awards focused on individuals who worked to expand and enrich reading and literature. The Gentle Advocacy Award went to K. Tempest Bradford for her willingness "to enter into blunt discourse about controversial issues." The Expanding Our Vocabulary Award went to John Clute for "exposing readers to new words, and, often, new ideas." The International Activism Award went to Charles Tan, whose Bibliophile Stalker and general energy has focused on "bringing writers from other literary traditions and countries to the attention of readers in North America, the United Kingdom, and Australia." Other awards recognized those who worked not only within the SF community, but without. The Tireless Energy Award went to Rina Weisman for her work with SF in SF and the Variety Children's Charity of Northern California. The Promotion of Reading Award went to Susan Straub, who founded and directs the Read to Me program, which advocates early reading and the development of the imagination by encouraging mothers to read to their babies. The Special Achievement Award was especially slated to recognize "individuals who are proactive behind the scenes but whose efforts often don't receive public recognition." In addition to receiving a coveted Hieronymus Bosch bird trophy, the award was named after its inaugural recipient, Neil Clarke, the founder of Clarkesworld and Wyrm Publishing. Among other things, Clarke began the Save the Semiprozines group which fought against a World Science Fiction Society amendment that would have deleted the semiprozines category from the Hugo awards. While the awards ceremony was informal, the VanderMeers hope to formalize it and continue it annually because, as Jeff explains: "There are no awards for service in genre, not specifically. There are awards like the World Fantasy Award that honor lifetime achievement, or fan achievement, but nothing like a comprehensive award with multiple categories. So, it seemed to fill a void and recognize people who don't often get recognized." For more information and updates about Last Drink Bird Head check out Jeff VanderMeer's blog, Ecstatic Days . The book can be purchased at Wyrm Publishing's store, where all proceeds go to ProLiteracy.org, which you can learn more about here. All award descriptions are quoted from the categories listed on Jeff VanderMeer's blog.